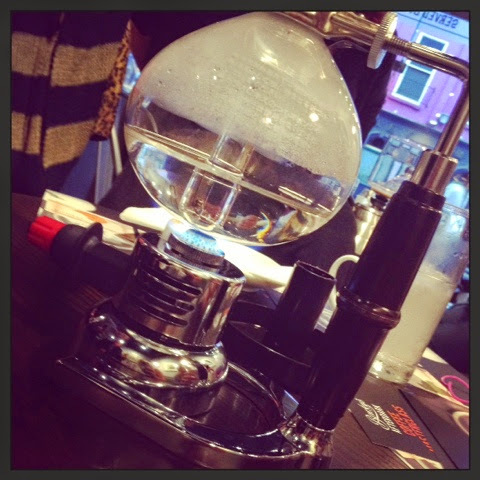 My guide to buying to buying the perfect gift for that coffee lover in your life..
A few months ago I was invited to a coffee master class hosted by Bewleys. It was a very chilled and informative evening where we got to taste three coffees from their "special collection". A number of these coffees are not only fair trade but also organic and each are quite different from the next. Which I think is perfect as there is a coffee that will suit everyone's taste. The first coffee is the Ethiopia, this is a sweet and aromatic coffee with delicate floral notes. What I got from this coffee was a gorgeous dark chocolate taste. I was told that this is a coffee for the adventurous!!! The Ethiopia is an organic coffee and fair trade. It is gently dried in the sun and then hand roasts by Bewleys in small batches. 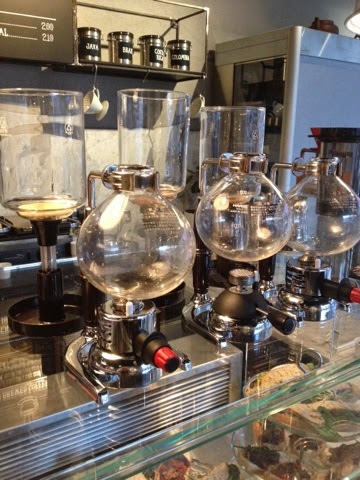 This brewing system is very simple to use. Begin by boiling 500ml in your kettle. 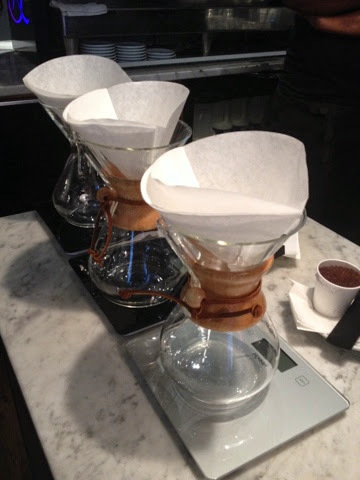 Place you filter paper In the Chemex and triple fold. Pre wet the filter paper then pour out the water. Add 35g of coarsely ground Ethiopia coffee and then pour 50ml of boiling water onto it and let it bloom. Wait for 30 seconds then pour the remaining water slowly into the filter in a circular motion. This process should be completed within 3 minutes. The second coffee we tasted was the Bolivia. It had a lovely rich flavour with more dark chocolate notes and also had a creamy caramel taste. The Bolivia is an organic and fair trade coffee. It is grown in high altitudes and hand roasted in small batches by Bewleys. 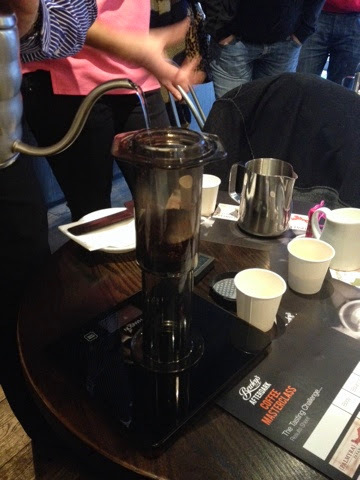 The brewing technique of choice for this coffee is called the Aeropress. Start by boiling the kettle then grind coffee to a medium/fine consistsancy. Wet the filter then place it in the Aeropress. Turn the Aeropress upside down then add in 18g of the coffee. Pour in 50ml of boiling water and stir. Leave to infuse for 30 seconds then stir again. Add 230ml of boiling water, stir once more then close the lid tightly. Turn the Aeropress right way up and place over your cup and slowly push down the plunger. Complete this technique in less than 2 minutes. Last but not least is the Panama coffee. 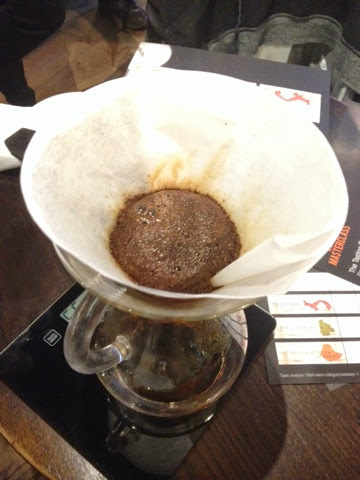 This coffee has lots of acidity but is very fruity and very clean. It has toasted nutty notes to it. I was told that this coffee is perfect as a breakfast coffee. 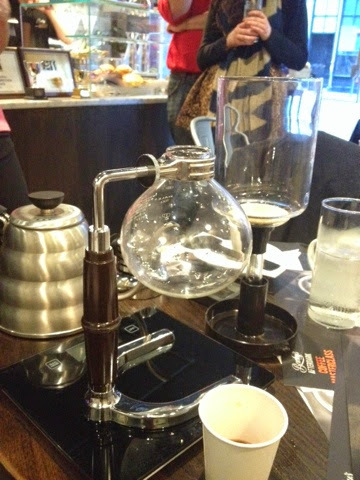 The brewing technique of choice for this coffee is called the Syphon brewer. It is definitely the show stopper of the three and you would be on to a winner if you presented this after your dinner party to your guests. It retails approx €90 to €100. Again the technique for this brewing system is not complicated even though it looks as if you would need a degree to make the coffee. Begin by boiling the kettle. Measure 18g of the coarsely ground coffee. Rinse out the filter in warm water then place it on the chamber. Fill the bottom glass chamber with 230ml of hot water. Turn on the burner and apply high heat. As this boils away the water will travel up to the top chamber. Once 3/4 of the water is in the top chamber start your timer and stir in a slow circular motion 3 times. After approx 45 seconds turn off your burner and stir in a circulate motion once more. The coffee will disperse into the bottom chamber it is then ready to enjoy. All three of these specialty coffees can be bought on Bewleys online shop for as little as €7.99 and they come in a very smart display tin. The perfect coffee lovers Christmas present indeed.